The religious leaders were ready to stone her. But Jesus defended the woman caught in the act of adultery. “Let any one of you who is without sin be the first to throw a stone at her,” he said. One by one they dropped their stones and left. It takes a minute for his words to sink in. I am loved just as I am: unchanged. But I know how the story goes. I prepare myself for this grace to be short-lived. Like a chameleon, Jesus is about to become like all the other religious leaders and scold me. He’s going to tell me to leave my life of sin. Fat chance of that. But when Jesus speaks, I don’t hear, Stop being so bad. I hear, Go ahead, you can leave your life of sin. You don’t need it. To illustrate his point, I am reminded of the play I just saw at Pacific Theatre. In Common Grace, Colleen has had an affair with Mark, a married man. Her sisters, mother, pastor, and Mark’s wife all tell her–with and without expletives–how this affair has hurt them. Yet Colleen remains unaffected by their speeches. Mark is her one true love, and she still dreams of a life with him. But when she unexpectedly experiences acceptance, she is confused. With this taste of real love, suddenly Mark’s is less desirable. Wait a minute. That last line isn’t in the script. Where did that come from? But Jesus bent down and started to write on the ground with his finger.When they kept on questioning him, he straightened up and said to them, “Let any one of you who is without sin be the first to throw a stone at her.” Again he stooped down and wrote on the ground. How do you feel about experiencing God’s love? “Pacific Theatre aspires to delight, provoke and stimulate dialogue by producing theatre that rigorously explores the spiritual aspects of human experience. In over 30 seasons, Pacific Theatre has produced more than 120 professional mainstage productions ranging from established works to original world premieres featuring some of the top theatre artists from Vancouver and across the continent.” Thanks to Ron Reed, founding artistic director, and the PT community for over thirty seasons of love mischief! “Stones” by Clint Mason on banner (not visible on home page). Used with permission. 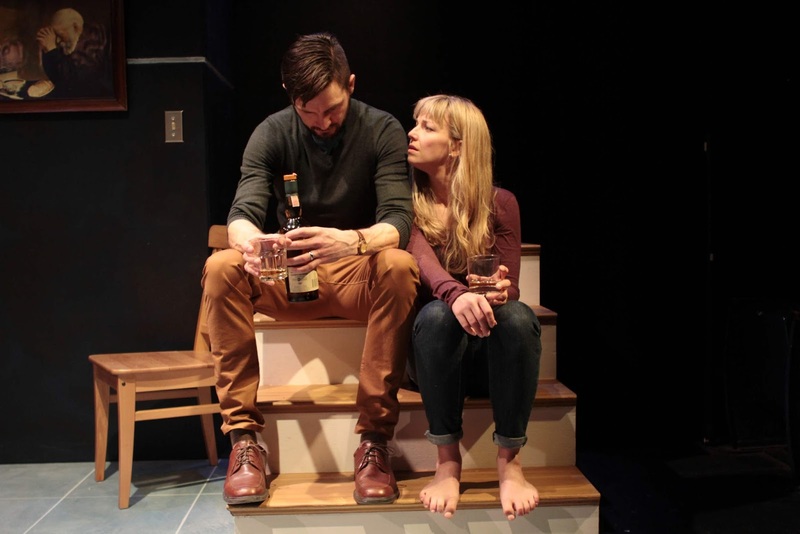 Image of Shauna Johannesen and Robert Garry Haacke in Common Grace by Shauna Johannesen, courtesy of Pacific Theatre. Image of Julie Lynn Mortensen, Cara Cunningham, Shauna Johannesen, and Kerri Norris, in Common Grace by Shauna Johannesen, courtesy of Pacific Theatre. Information about Pacific Theatre is from their website. This entry was posted in Lent, Popular Posts, Stories and tagged Cara Cunningham, Clint Mason, Common Grace, Don't change., Esther Hizsa, John 2:2-11, Kerri Norris, Pacific Theatre, Robert Garry Haacke, Shauna Johannesen, spiritual director Burnaby, spiritual director Vancouver, stones. Bookmark the permalink. Great post Esther. I just saw a painting of the gospel story referred to (by Robert Wagner) but it was called ‘The Men Taken in Hypocrisy’, which gave me a start. We might do well to retitle many of the parables and gospel stories, to make us look again, and see more clearly where the true centre lies. Anyway, DeMello’s words – and yours – are the ones I needed to hear just now. Thank you. Thanks for telling me about that. Thank God for artists who startle us. Excellent post Esther. Thank you. I’ve been thinking about what fullness or richness of love is lately and this elevates the startling nuances of an aspect of the process of transformative work of His love to me.